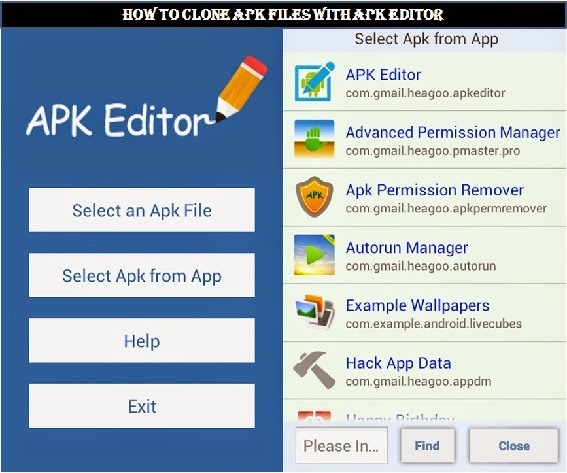 Apk editor is an awesome android app that let's you edit/hack any android app in apk format. With the app, you can easily do things like, string localization, background image replacement, layout re-architecture, and even ad eliminating, permission removing, etc. Depending on what you use if it for. Another great perspective of Apk editor is that you can use it to clone multiple android apps. Today's stroll I would brief you guys on how to clone apk files with APK Editor. · You would be needing the patch file of APK Editor and APK Editor. Download from here. · You would also need Winzip app to unzip the files with your android phone. Once the above requirements are being downloaded to your android device, then you can proceed through the below steps. 1. Install the APK editor and then open the /sd card/ directory. Also install the patch file to overwrite the editor, so the trick can work perfectly. 2. Then make sure you download the APK file that you want to clone. You don't have to download it from playstore, just follow the guide on how to download APK files directly to your device. 3. Once you have downloaded the APK file, then open the APK editor file manager app, and then find where you downloaded the apk file to. If used your PC to download it, then remember to transfer it to your android device and locate it from the apk editor file manager. 4. Once you have located the APK file, simply long press on the file and then a pop up would display, then click on Clone followed by OK.
5.Then another pop up would be displayed, then you can change the Apk file name to whatever name you like it to bear. 6. Once this is done. Then use your file manager app to locate the clone of the app you just created, then install it through there and a similar app would appear on your android menu screen. You can perform same procedure to different type of APK app you wish to clone, be it social app, utility apps or any other app. Hope this brief tips helps. Don't forget to join our email readers for more android tips and tricks.